Roughly a thousand stars (947+) of spectral type "K" have been tentatively identified and located within 100 light-years (ly) or (or 30.7 parsecs) of Sol, but only 155 within 50 ly. In the case of these relatively dim and difficult to study stars, we should examine first the inner sphere of space within 50 ly of Sol. Only around 26 are now known to be located within 25 ly, while another 127 are estimated to lie between 25 and 50 light-years. However, based on the known density of K stars within 25 ly, we would expect a total of 216-some stars within 50 ly, rather than only 155. A comparison of the density of K-type stars between the two volumes of space indicates that the outer spherical shell has around two-thirds (68 percent) of the spatial density of known K-type stars as the inner spherical volume, which suggests that astronomers have yet to identify a significant share of K-type stars that are actually located within 50 ly of Sol -- much less within 100 ly. If we anticipate that around 216 K-type stars may eventually be found within 50 light-years (ly) of Sol, then we would expect that around 1,728 stars may eventually be found within 100 ly. However, since only around 949 some K-type stars are known to be located within the 100-ly sphere, it may be that astronomers have only identified around 55 percent of these relatively dim stars that are actually located within 100 ly of Sol. Indeed, many K-type stars that are already cataloged lack high-precision parallax estimates, and others may be mis-typed as early M-type stars. As relatively common binary companions of brighter stars, some K stars may be orbiting too close to have been spectrally typed with high confidence. Of those thousand some K-type stars, astronomers believe that 18 have evolved out of the main sequence into giant stars, while an additional 36 or so may be subgiants (more on nearby giants and subgiants). As many as 43 K-type stars have been identified as being located in Sol's immediate neighborhood (within 10 parsecs or 32.6 light-years). Due to their proximity, some of the brightest, nearby K-type stars can be seen with the naked eye in Earth's night sky. As of July 2006, astronomers have been able to detect the presence of planets around only around 21 K-type stars -- or about two percent -- of those thousand some stars located within 100 ly of Earth. 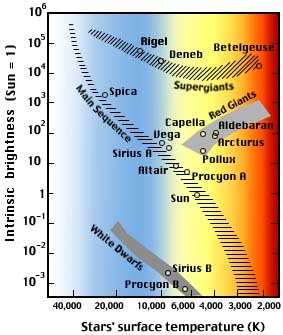 Compared to hotter and brighter OBAFG type stars, K type stars radiate more light towards the infrared end of the spectrum. For K-type stars, their spectral lines are characterized by the presence of many neutral and ionized metallic lines (iron, calcium, and strong molecular lines like CH and cyanide) and very weak hydrogen Balmer lines. Main-sequence K stars have surface temperatures of 3,500 to 5,250 K and around 10 to 42 percent of Sol's luminosity. K-type dwarf stars appear to have between 0.65 to 0.84 Solar-masses, which indicates in theory that these stars may spend from over 17 to as few as 15 billion years in the main sequence fusing core hydrogen (more from CSIRO Australia). Much more luminous than their main-sequence counterparts, K-type, giant stars, such as Arcturus, are relatively common (for giant stars) in nearby space. K-type supergiants are much more unusual and distant. They seem to have a mass exceeding six to as much as 12 or more Solar-masses with thousands of times Sol's luminosity. At around 1,400 light-years from Sol, the "RV Tauri," pulsating variable R Scuti (R Sct) is an interesting example of a K-type supergiant (K0 Ib), with a luminosity of around 4,000 to 5,000 times that of the Sun (after uncertain corrections for infrared radiation and for absorption of starlight by intervening interstellar dust). Procyon A, and Sol, respectively. The following celestial objects are located within 30.7 parsecs, 100 light-years (ly), of Sol. 40.4 85 Pegasi B K6 V 0.55 Pegasus Gl914 B, BD+26 4734 B? Summary information on brighter and larger, blue-white B, bluish white A, yellowish F, yellow-orange G, and many red M stars within 100 light-years are also available. Try Professor James Kaler's Stars site for more discussion of spectral classification as well as information on individual orange-red stars. Up-to-date technical summaries on some stars can be found at: NASA Star and Exoplanet Database, the Astronomiches Rechen-Institut at Heidelberg's ARCNS, Centre de Données astronomiques de Strasbourg's SIMBAD, and www.alcyone.de's bright star catalogue search. Additional information may be available at Roger Wilcox's Internet Stellar Database. © 2006-2014 Sol Company. All Rights Reserved.